We will have a fish pond meeting in collaboration with the Seminole County Young Farmers group on Monday April 28th at 7:30 pm at Jo’s Family Restaurant(New Location) in Donalsonville. 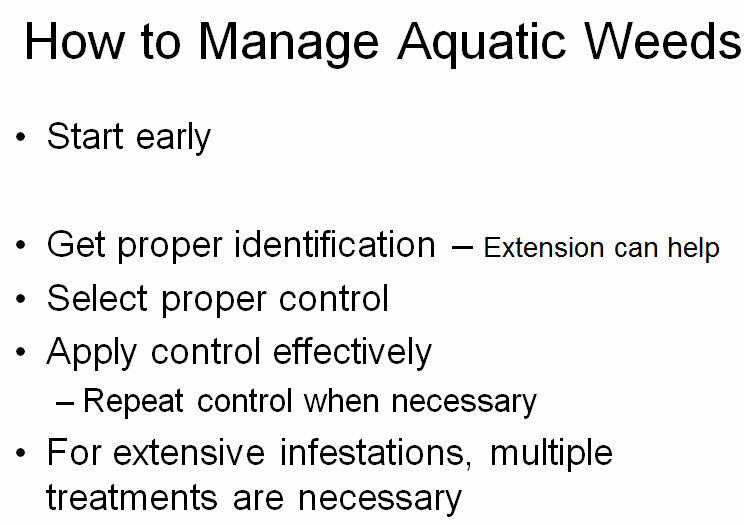 UGA Extension Scientist, Dr. Gary Burtle, will be here to talk to us about ponds and weed control in them. Come join us if you have an interest. Snap beans are a quick crop but this year they got a slow start with the cool and wet weather. They are looking better recently, however and the oldest fields will soon be blooming. 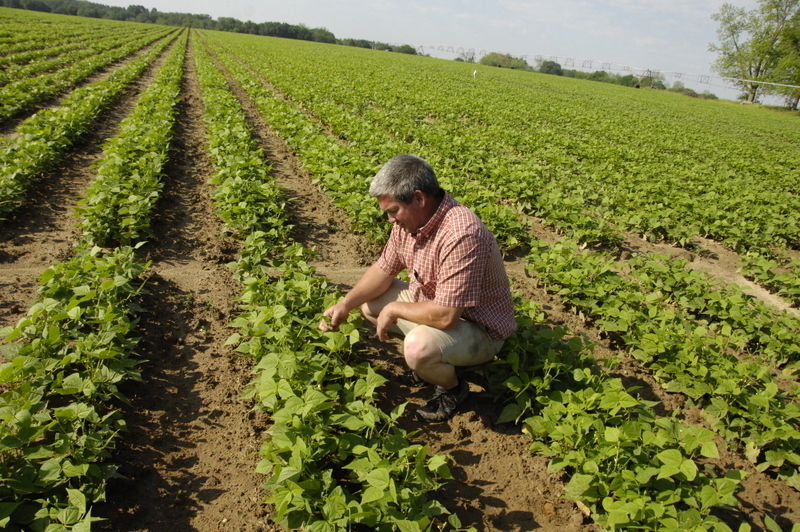 Here’s Brad Thompson, our local snap bean guru, in one of his oldest fields. Last year we saw a good amount of environmental buggywhipping in corn with the unusual weather we saw and we are seeing some again this year. This occurs when there is a problem with the leaves coming out of the whorl. It sticks and twists over, caught in itself. Usually in a week or so it breaks free but the plant is affected for a while and very yellow. 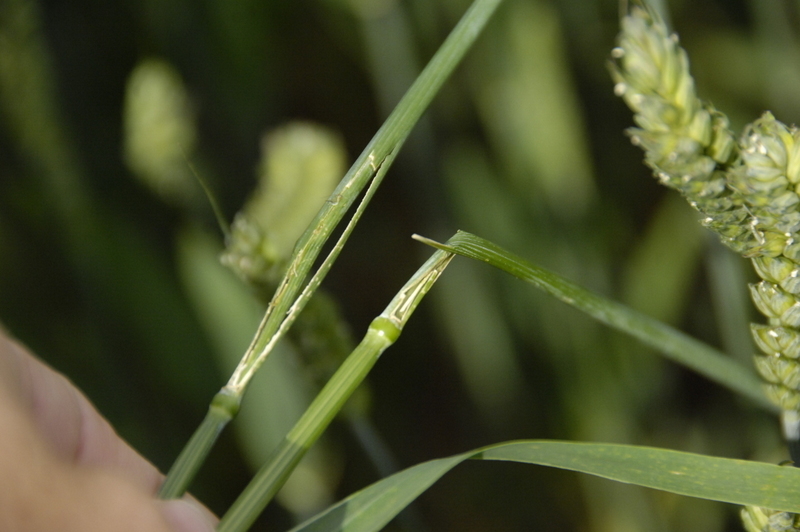 This can be caused by insect damage but usually is the cool and hot weather changes. This week I have the following question for you. 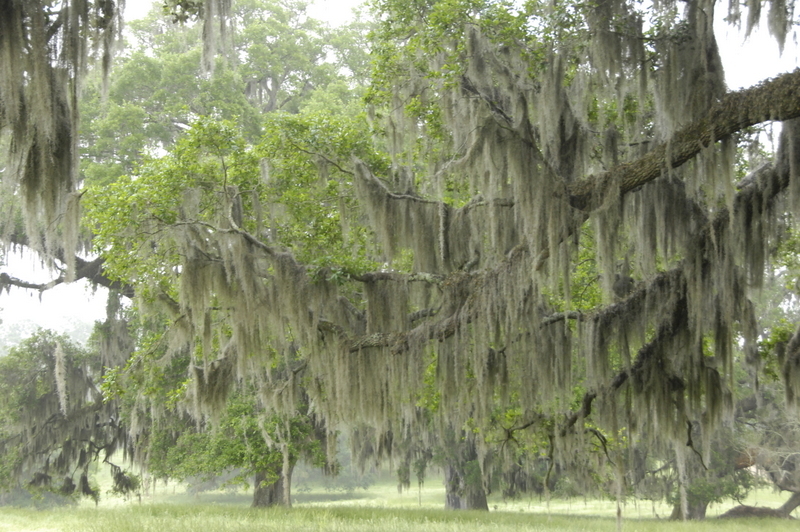 What is this hanging from the limbs and is it a problem for these live oaks? 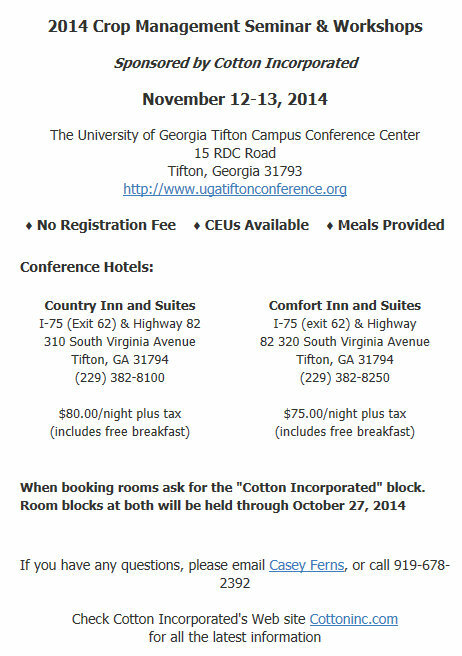 Two important cotton items of interest are coming up soon. 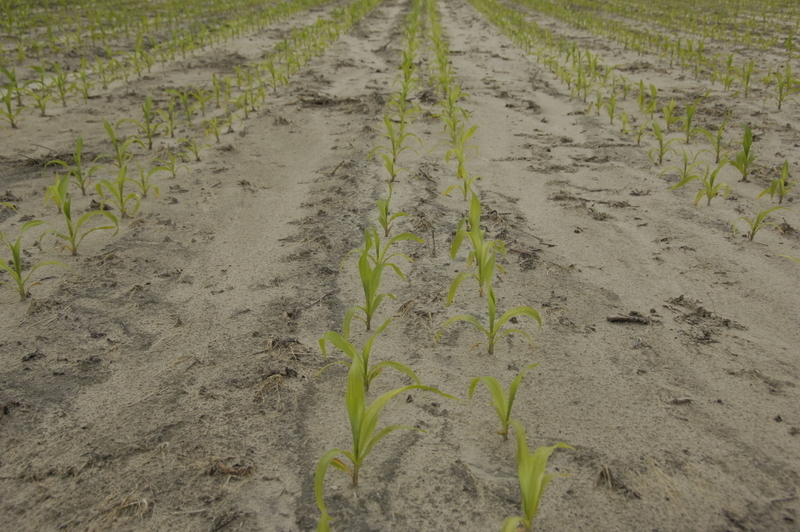 Our rainy conditions have leached some nutrients in corn fields and one of them is Sulfur. 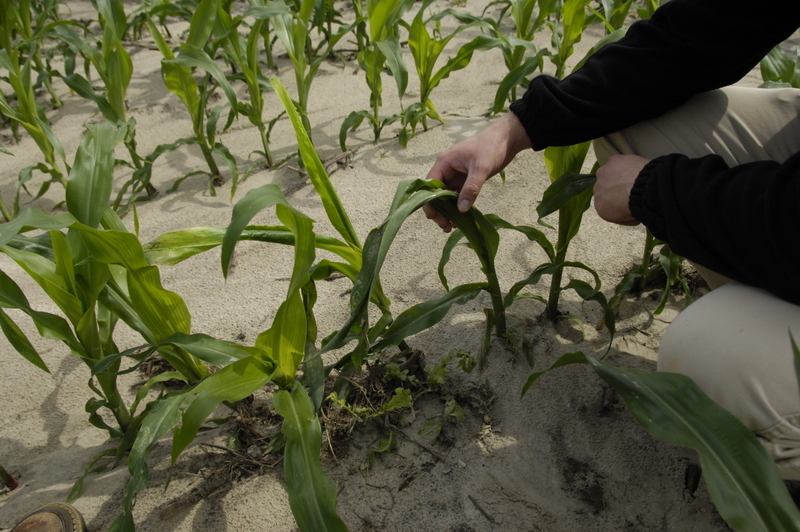 Sulfur is a nutrient that is not needed in high amounts but is needed by plants, especially corn. Sulfur is classified as a secondary element. In one of my soils classes at UGA we talked about that when we burned lots of coal, sulfur dioxide was put into the air and made it to our fields, but now we have to supply more than long ago. 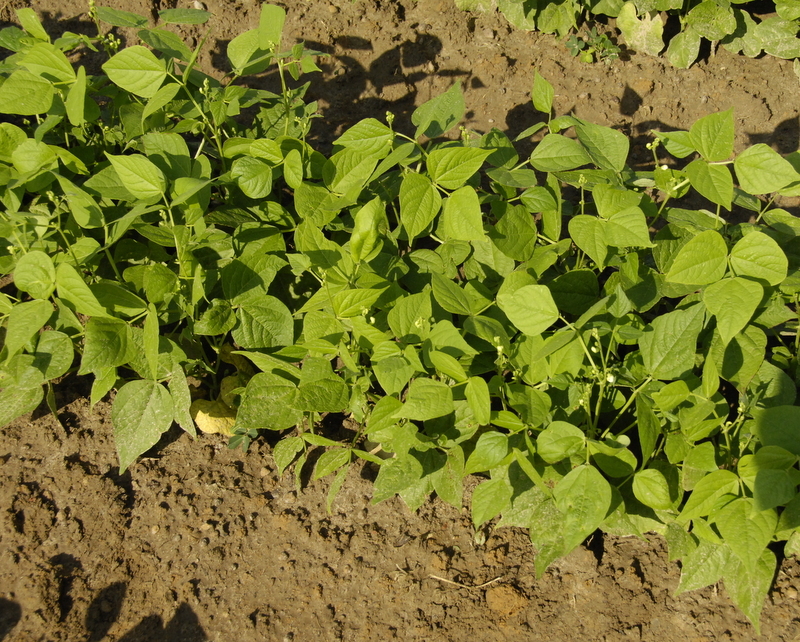 Sulfur is essential in forming plant proteins and deficient plants look very pale yellow especially in new growth areas as it is not well translocated to new growth as some nutrients are. Cold wet soils delay the release of sulfur from organic matter as well. Also, we can run into a problem when our N:S ratio is too high. In other words we need a certain amount of sulfur to go with our nitrogen and if we don’t have it then the Nitrogen doesn’t do as much good for the plants as it should. 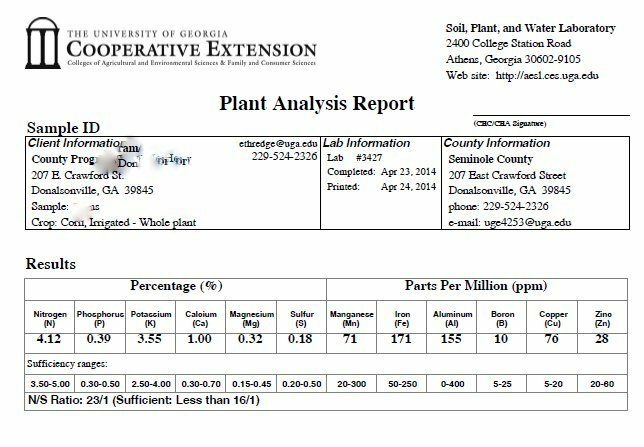 In corn we want this ratio to be less than 16:1 or we don’t have enough sulfur in the plants. This tissue sample taken last week in a very yellow corn field shows this problem. Some corn still looks tough but it’s looking better with our warmer temperatures and sunshine and sidedress fertilization. I suspected nematodes in this field last week due to the poor growth and the uneven growth of plants in areas of the field and some “patchiness” where nematodes were higher in numbers perhaps. We took a sample and we did find Stubby root nematodes causing problems out here. We could say that there’s not much we can do now about it, but there is. Since we have a compromised root system we can baby the field along until we get good growth and perhaps after that. We have seen in the past where we have early season nematode problems in corn we can do a lot to overcome it with good management. We can be sure to be very timely with irrigation when it gets dry and we can spoonfeed nitrogen and sulfur to help out and maybe use a bit more as well. Stubby root was the problem in this field but other nematodes can also cause corn problems like Sting and Southern Root knot ( the kind that affects cotton). 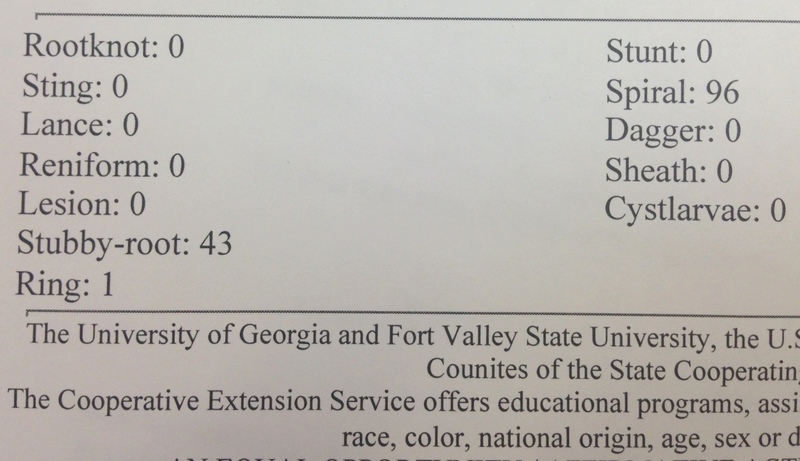 Here’s a link to an excellent UGA publication concerning nematodes. The grower may want to use a nematicide preplant or at plant the next time corn is grown here. 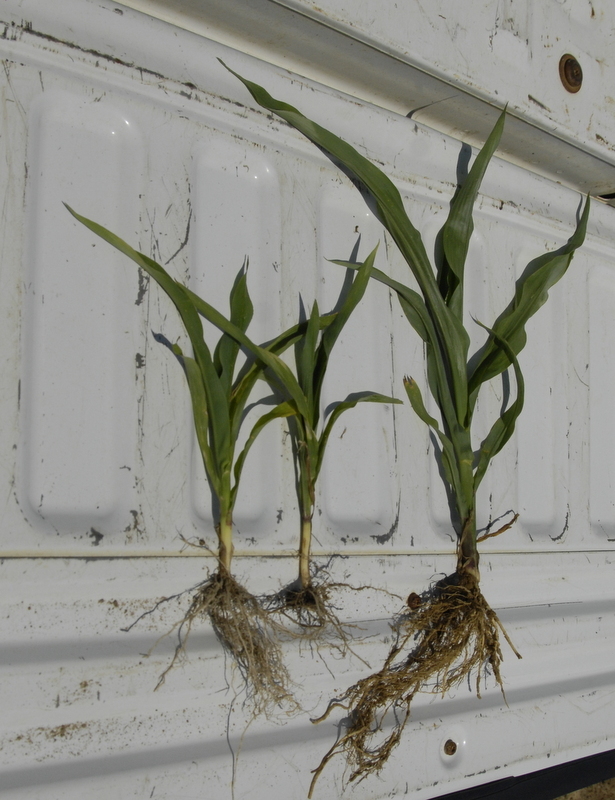 Here’s a photo showing the plant growth differences you can get in the same field with patches of nematode problems, the roots are greatly affected which leads to the plant size differences. 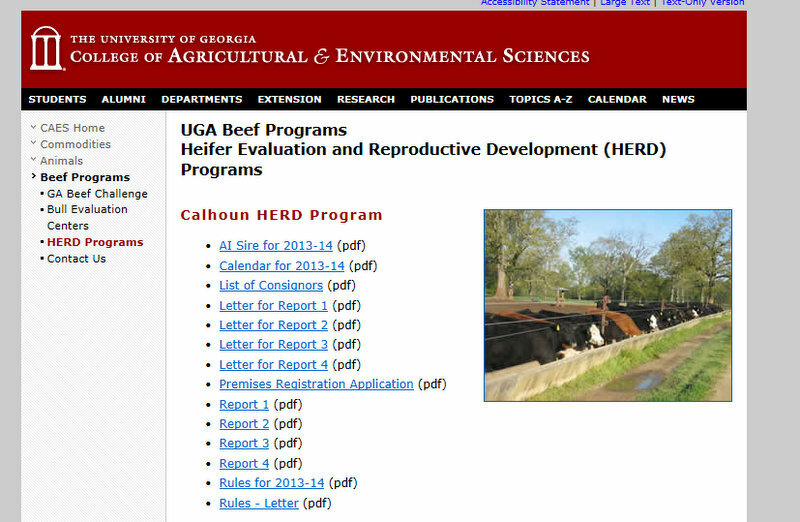 Scroll down to Tifton HERD Program. Click on Catalog (pdf). Click on Sale Order for 4/22/14 (pdf). The weed I had a photo of last week is Shepherd’s Purse (Capsella bursa-pastoris). It is a turf grass, garden or pasture weed that we sometimes see, that grows similar to dandelions and has a heart shaped seedpod. 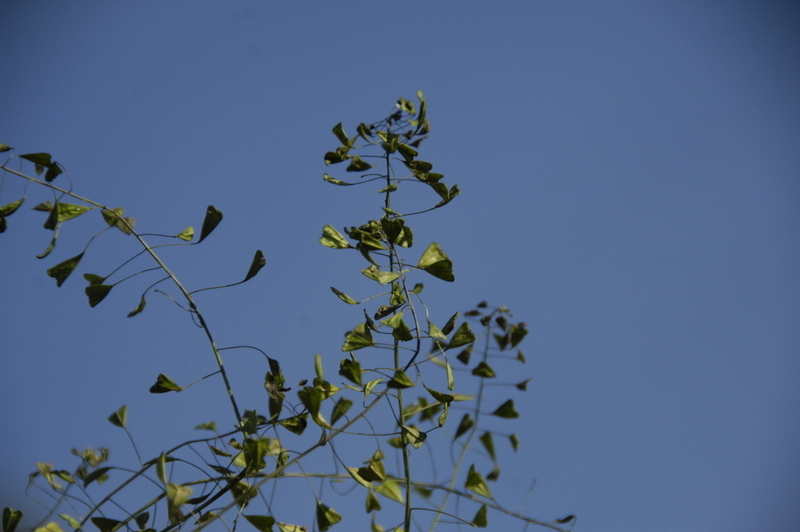 I guess it also looks like a shepherd’s purse? It is purported to have medicinal values. Here is this week’s question. 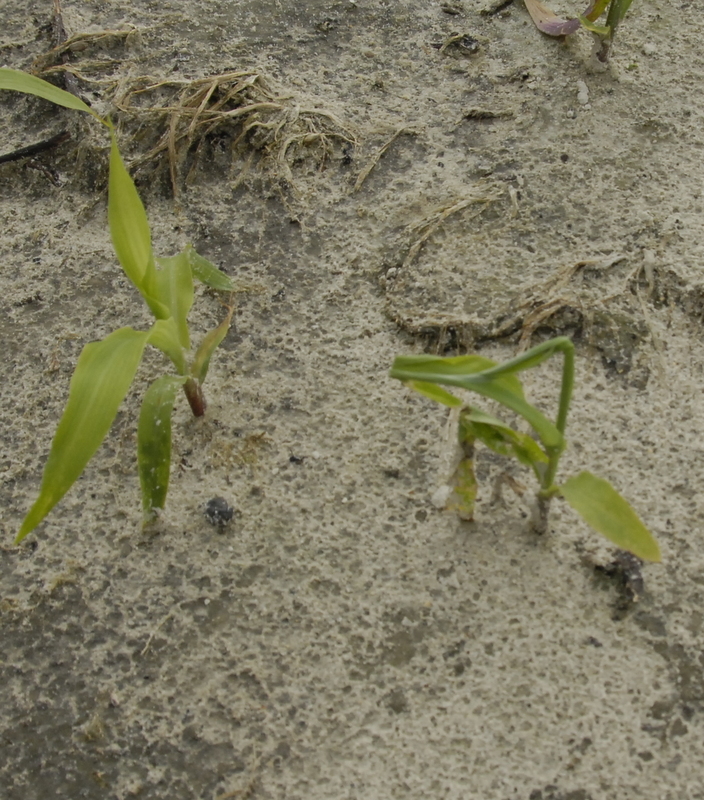 What is this condition of corn on the plant on the right, that we saw a good bit of last year and we are seeing some again now? 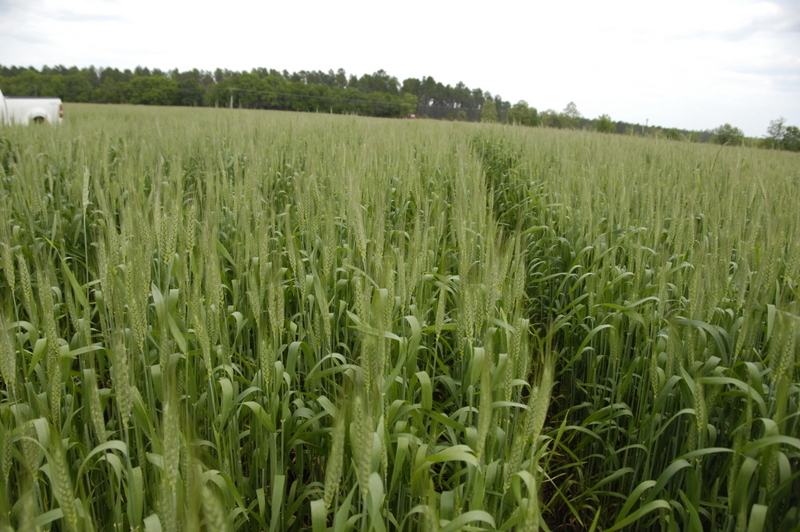 Wheat is mostly headed out in deep south Georgia and is looking pretty good. It’s a little later than usual this year. 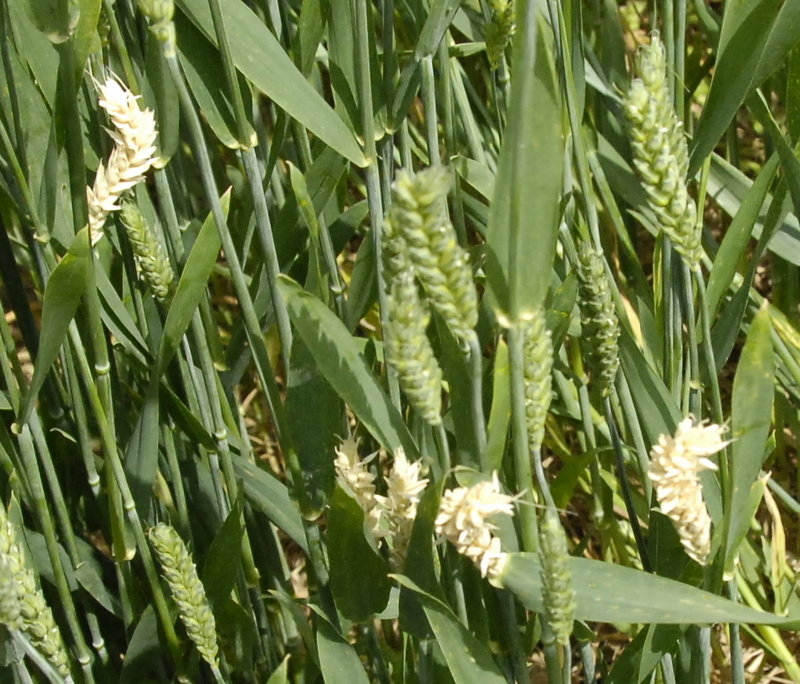 You can see that these wheat heads are blooming. Remember that this is a perhaps a very rough estimate of yield. 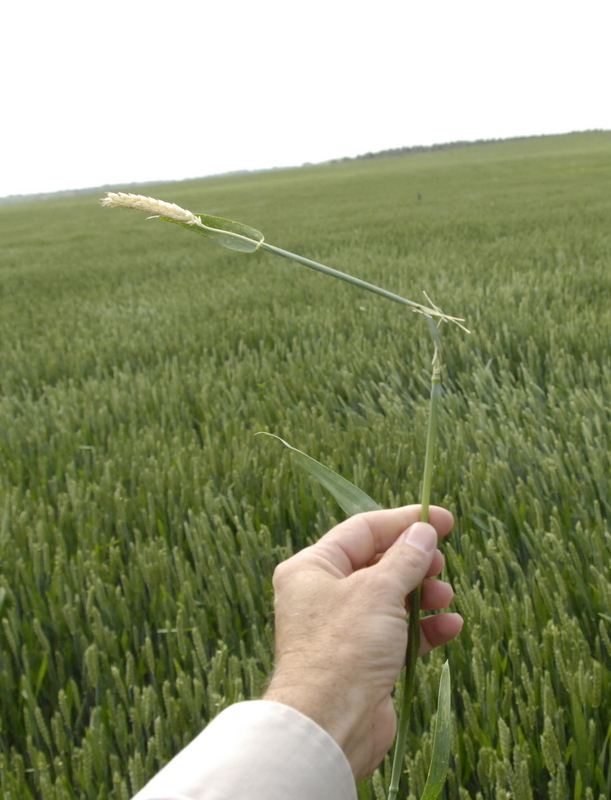 This is an unusual problem in wheat for us to see, Wheat Stem Maggot. Decatur County Agent, Justin Ballew saw some of this earlier in the week and correctly identified it and I saw some yesterday in a field near the Chattahoochee river here in Seminole County. The maggot apparently bores into the stem at the bottom of the top internode and the grain head dies and turns white and you can pull it out pretty easily. 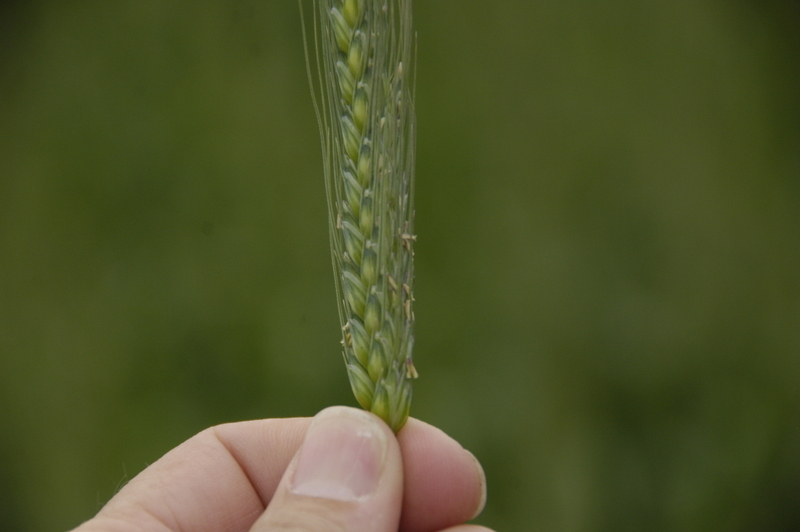 I saw several affected heads in an area yesterday but it was a low overall incidence in the field, it seemed. Some of our corn is just coming up good but most is at V2 and the oldest is at V5 growth stage. Most of it has a yellow color for several reasons, here are the top 4 in my mind. 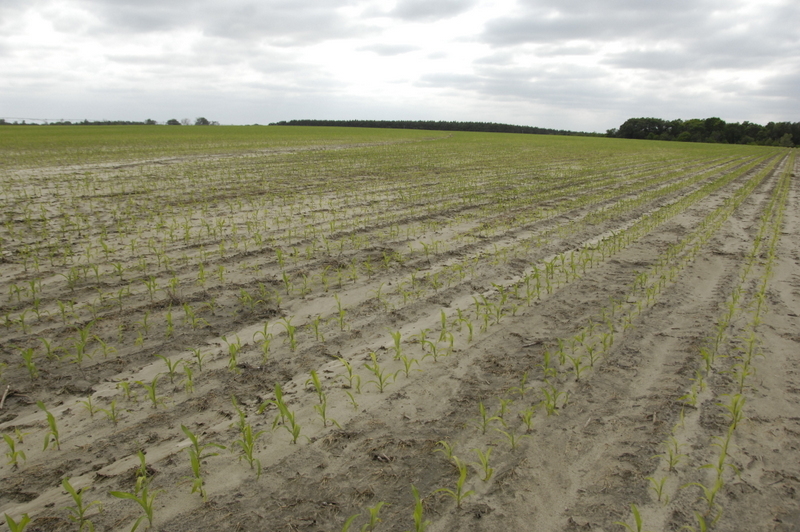 Leaching rains have depleted nutrients such as Nitrogen and perhaps Sulfur and it’s time to add more but it’s too wet to run the spreaders or liquid rigs to put it out. Another reason is the erratic cool weather, with some very cool nights such as the unseasonable 38.5 degrees F on April 16th at the Donalsonville weather station. A third reason is the wet soil. The soil is staying so wet that we are loosing soil oxygen and that is bad for roots. The plants are affected. 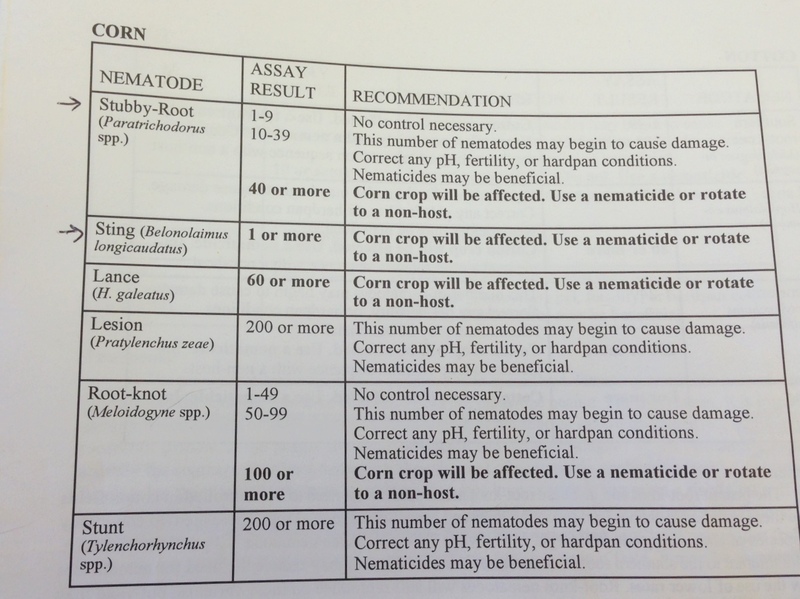 Reason number 4 goes along with the poor growing conditions, nematodes. 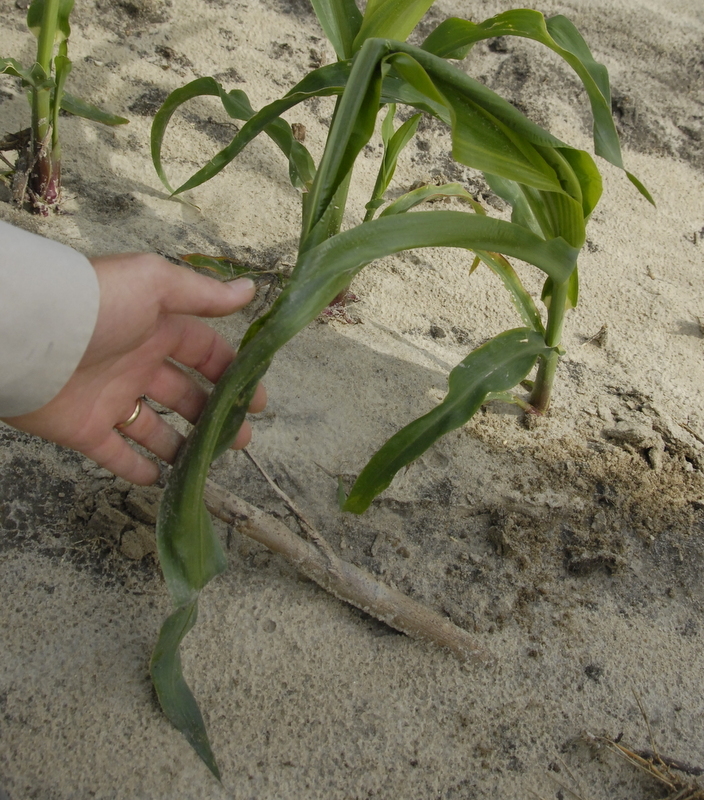 Damage from nematodes in corn shows up much worse when we have poor growing conditions. Nematodes affect the roots and therefore plant growth and health. A last reason that we won’t count is that where over the top herbicide applications have been made, that many times further yellows corn for a few days as well.